RDC Library and the DSB! This blog post features collections and services for the Donald School of Business (DSB), as well as information about RDC Library at the DSB and at Main Campus. RDC Library is at the DSB Learning Common! The Information Desk is open Monday to Friday, 8:30 am to 4:30 pm. Ask our friendly staff if you need to sign out technology including laptops, flip camcorders, digital microphones, calculators, and more, or if you need some help using the scanners or multimedia workstation software. You can also buy a bus pass, load your iCard, print, book group study rooms, and sign out reserve texts. We can also provide research and citation help. We are happy to help you with all of your questions, so please do ask! We also offer Academic Support, which includes the Math Learning Centre, peer tutoring, the Writing Skills Centre, Learning Skills and Strategies, and Disability Resources, which provides specialized support for students. DSB students are invited to access these resources: we have peer tutors who are happy to meet you at the DSB! If you’d like a bit of writing help, we are also a member of eTutor Alberta, which provides online writing tutoring. Like all of our tutoring, this service is free to RDC students! We also encourage students to study with us at RDC Library on Main Campus. We encourage all students to use our quiet study space, group study rooms, computers, and comfortable seating. Our Winter Term Hours allow you to study until 9 PM Monday to Thursday, and 5 PM on Friday, as well as weekends. Check for our extended hours during exams. The Virtual Self: How our Digital Lives are Altering the World Around Us. Your iCard is also your library card, so have a look at our collection! We also have library guides for many DSB programs, including Administrative Professional, Business, Communications & Media, Law & Legislation, and Unit Clerks. These guides include sections on how to research, finding books and articles, evaluating information, and citation, as well as how to Ask Us! via chat, text, phone, and email. RDC Library provides learner-centred resources and services to all students, staff, and faculty, as well as our community. For more information, please contact Jillian Sinotte, Librarian for the Donald School of Business. All members of the Library Information Common sympathize with your frustration with the printers in the Library. It is a frustration to us, too. IT Services is doing its best with the limited resources at its disposal as well as innumerable demands across the College community for a variety of information technology requirements. Given the unpredictable and temporary nature of this problem, we ask that you bear with us. We are working with IT Services on an improved, permanent printer solution. Of course, RDC Library supports education and learning of all kinds, but the Library also houses some unique items for the School of Education (Bachelor of Education-Middle Years, Early Learning & Child Care, Educational Assistant, and Transitional Vocational Program). Any RDC Library patron may borrow Curriculum materials. And did you know Central Alberta school teachers and Central Alberta high school students can get a free membership? To support Early Learning & Child Care, we also have a toy collection, located on the 2nd floor in the video/media section. Browsing works best (and is the most fun!) for discovering these items. Our Library Desk staff are happy to help you locate any of these items, or to discover more online start with our Library Catalogue, Subject Guides, or just Ask Us! RDC Library provides learner-centred resources and services to all students, staff, and faculty, as well as our community. For more information, please contact Yvonne Phillips, Librarian for the School of Education. Mirroring the growth and direction of science for nearly a century, The CRC Handbook of Chemistry and Physics continues to be the most accessed and respected scientific reference in the world, used by students and Nobel Laureates. While you can just open Handbook of Chemistry and Physics as a pdf eBook online, it’s also a true database that lets you perform complicated property searches and draw chemical structures. RDC’s CRC Handbook of Chemistry and Physics can be accessed through One Search in ‘Find Books’ using the Red Deer College Access link, the Retrieve Catalogue Item link (NEOS catalogue), or by the Red Deer College Access link in the ‘Detailed Record’. It can also be found on the Article Databases A-Z list through the ‘Find Articles’ link on the RDC Library homepage. As well, this online resource is linked in the Library Subject Guides in related subject areas. Current print editions are also located in Library Reference and Main collection areas. BONUS! 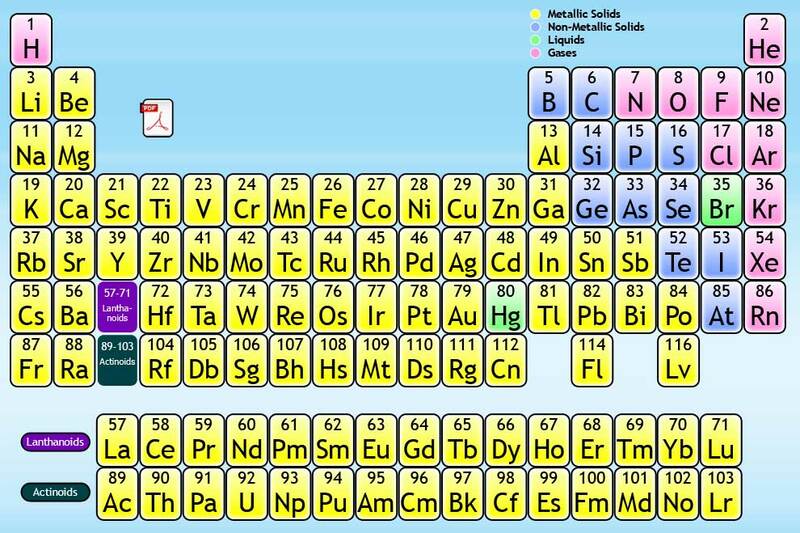 The CRC Press Periodic Table Online is now FREELY available.